The developers of the Opera web browser have been inventive in past years, and it is a confirmation of their hard work that many of the features that they have introduced in Opera are now part of nearly every other Internet browser as well. Not all features on the other hand have been "borrowed" by other companies. Opera Turbo is such a feature. First introduced in 2009, it built on Opera's extensive knowledge of mobile browsing. In mobile browsing, even more so years ago, speed was essential. Imagine having to wait a minute or more for a website to download, which was not uncommon those days. Today broadband speeds are more common but there are still situations and places in the world where you do not get high speeds, where every Kilobyte counts so to say. And that's where Opera Turbo revolutionized the browsing. In its core, Opera Turbo is nothing more than a way to compress websites. Many users know that they can compress files to save space, which is also beneficial if those files need to be send by email or uploaded to the web. The very same concept, albeit more sophisticated, is being utilized by Opera Turbo. Part of the traffic is redirected through Opera servers. The Opera server compresses elements of that website and sends them to the user's browser. The benefit is a faster transfer of the website to the user's system which in turn means that the website is displayed faster in the browser interface. You activate and deactivate Opera Turbo with a click on the Turbo icon in the Opera status bar. The compression technology is disabled by default, and needs to be enabled before it becomes active in the web browser. The icon turns green when it is activated so that it is easy to identify the different modes on first glance. With Opera Turbo on, all websites that use the http protocol are redirected through the Opera Turbo servers where they are compressed before send to the user computer. HTTPS connections, for instance on financial sites or sites like Facebook or Twitter are not compressed by Opera Turbo. You can disable Opera Turbo at anytime with another click on the Turbo icon. Now that we have established what gets compressed, we should take a look at the benefits in detail. 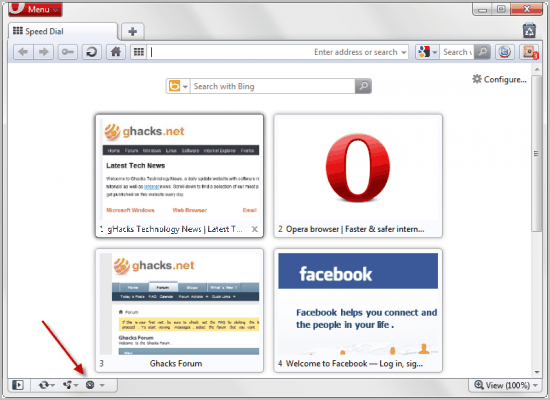 The old version of Opera Turbo back in 2009 managed to reduce the size of the page download by 25% to 75% depending on the site in question. A 1000 Kilobyte site like Wired for instance was reduced to 550 Kilobytes which in turn meant that the web site loaded in about half the time it would have without Opera Turbo. 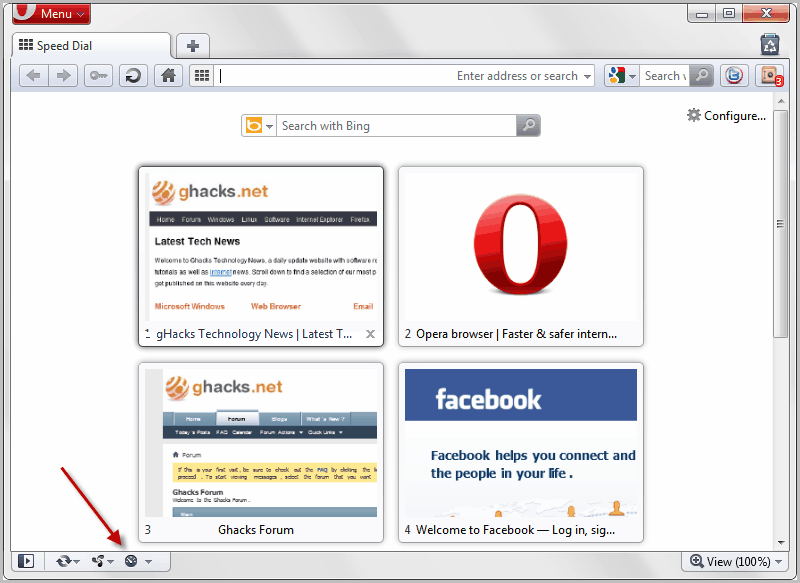 With the old Opera Turbo, users got a 25% to 75% speed increase over standard connections to websites. 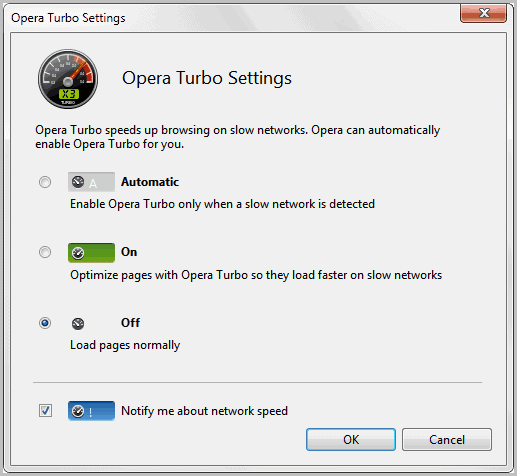 Opera recently introduced the new Opera Turbo. The main improvements are a switch from the JPEG format for images to WebP and improved network connections. Take a look at how this reduced the overall transferred data on the following sites. As you can see, the switch to WebP and the additional improvements have reduced the file size by another 22%. Even better, the image quality has actually improved thanks to the format switch. But those tests have been performed by Opera, how about some of our own? You save a lot with Opera Turbo, especially on sites with lots of images that are not overly optimized. The only sites where you won't save as much as multimedia sites, for instance Youtube as the videos are not compressed. Still, if you are short on bandwidth you will notice a huge speed increase by enabling Opera Turbo. There is not really a lot that you can criticize. Probably the two main points are that image quality may be noticeably worse in some occasions and that the traffic is redirected through the Opera server. It should be clear that the quality of images gets reduced if they are compressed by Opera Turbo. That's one of the downsides of the feature. There does not seem to be an option to load individual images without compression if Opera Turbo is enabled. The only option for now is to disable Opera Turbo if you want to see the images in their original quality. Privacy on the other hand is a completely different beast. It basically boils down to this: If you do not like it do not use it. There is not really anything that you can do about the fact that Opera Turbo requires that the traffic is routed through Opera as this is the only way to compress the data before it gets send to your computer. Lastly, it needs to be noted that websites will see a different IP address when Opera Turbo is active. While that actually improves privacy for some users, it can also mean that you may see contents, for instance advertisement, optimized for a different country in the web browser. Internet users who are on dial-up connections, slow networks or on a limited high-paying bandwidth plan benefit the most from Opera Turbo. The ability to turn the feature on or off with a switch should be enough to convince users to give it a try, considering the speed gains and bandwidth reductions that can be achieved with Opera Turbo. Interested users can download the latest version of the Opera web browser from Opera.com. And yes, all Opera browsers come with Opera Turbo by default. This concludes the first part of our Discovering Opera series. Stay tuned for more. A detailed look at Opera Turbo, a built-in compression option to compress traffic by routing it through Opera servers before it arrives on the user's computer. You can actually reload individual image in Full Quality by right-clicking them, and click ‘Reload Image in Full quality’. Hope that helps. Bob I do not have that option in the latest version of Opera. 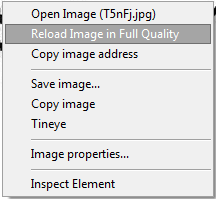 I only see reload image, is that the setting you mean? It does not appear to improve the quality of the image though. A clean install should help with that since it’s most likely a case of upgrading over an older version. It should be mentioned that if you’re really strapped for bandwidth you can also go to Preferences/Advanced/Content and tick “Enable plugins only on demand”. It made no visible difference while browsing from the desktop, but it had a clear impact while using my phone as a modem. Thanks, I try that out. The option is not showing on right-click in my version of Opera. I agree that enabling plugins on demand is another great option to save bandwidth. And actually when you have Opera Turbo enabled, “Plugin on demand’ is enabled by default. Discovering Opera is a very needed :) Could You please in the future tell about Operas menu.ini configuration? like all the [Document Popup Menu], [Link Popup Menu] what they all mean to configure context menus etc? I may add, that on connections over about 256 kbit the Turbo stops to be noticeable. Sometimes Turbo servers seem to be overloaded and there are minor problems with commenting on specific sites with Turbo on, but still this is great adventage. Im torrenting heavily at the moment (and I will for at least two more weeks) and on my connection browsing is almost impossible without Turbo at the moment. It is possible to reload each image, at high quality, after Turbo mode has been used. This gives you the facility of a ‘preview’ mode, in effect, allowing you to save bandwidth allowance/time for those images where you want to recall it in high quality format. Right click on an image, Reload Image In Full Quality…. Great that a site supposed to be telling people about Opera, did not know about this… I wish Opera did one of these Opera lessons, perhaps on a 30 day Cycle with RSS feeds…. I did not know about this because the option is not there in my version of Opera. Now what? My particular version of Opera doesn’t seem to have the ability to turn turbo on or off. I use an older version but not ancient, version 32.0, and the settings are deceptively simple and don’t give any options for the turbo thing. It’s just not mentioned.